Kids will enjoy Central Park and The Metropolitan Museum of Art. There's lots more to do: tour the pleasant surroundings at The High Line, admire the landmark architecture of Empire State Building, don't miss a visit to Rockefeller Center, and take some stellar pictures from Top of the Rock Observation Deck. To see where to stay, maps, other places to visit, and other tourist information, refer to the New York City travel planner. Minneapolis to New York City is an approximately 6.5-hour flight. You can also drive; or do a combination of bus and train. The time zone difference when traveling from Minneapolis to New York City is 1 hour. In August in New York City, expect temperatures between 83°F during the day and 68°F at night. Wrap up your sightseeing by early afternoon on the 16th (Tue) to allow enough time to fly to San Francisco. Start off your visit on the 17th (Wed): snap pictures at Golden Gate Bridge and then stroll through Alcatraz. Keep things going the next day: explore the engaging exhibits at The Exploratorium. For more things to do, maps, ratings, and other tourist information, use the San Francisco holiday planner. Traveling by flight from New York City to San Francisco takes 9.5 hours. Alternatively, you can drive; or do a combination of bus and train. Traveling from New York City to San Francisco, you'll gain 3 hours due to the time zone difference. Plan for slightly colder temperatures traveling from New York City in August, with highs in San Francisco at 72°F and lows at 57°F. Cap off your sightseeing on the 18th (Thu) early enough to go by car to Yosemite National Park. Start off your visit on the 19th (Fri): explore the striking landscape at Half Dome. 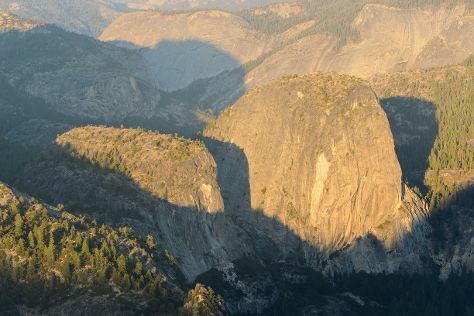 Get ready for a full day of sightseeing on the 20th (Sat): take in the dramatic natural features at Sentinel Dome and then explore the striking landscape at Glacier Point. For photos, maps, reviews, and more tourist information, use the Yosemite National Park itinerary planner. Traveling by car from San Francisco to Yosemite National Park takes 4 hours. Alternatively, you can take a bus; or do a combination of train and bus. While traveling from San Francisco, expect a bit warmer days and a bit cooler nights in Yosemite National Park, ranging from highs of 82°F to lows of 43°F. Finish up your sightseeing early on the 20th (Sat) so you can travel back home.